Finding the right holiday gifts for your friends and family can sometimes be a difficult task, especially when you need heart healthy holiday treats. There are just too many people to find the right items for, and you want your gifts to be meaningful without being expensive or difficult. Edible holiday gifts are an excellent solution to all of these issues. Edible holiday gifts are great meaningful, personalized gifts that show how much care by the time and effort you put into each individualized gift. Edible gifts are also inexpensive and super easy to put together. The packaging you use for each gift can be individualized quite easily, and just a few crafty touches like some simple ribbon can make a simple gift like this look extraordinary. Even better, edible holiday gifts are perfect for just about every holiday so the options and opportunities are limitless. To show you care even more, you can make edible heart healthy holiday gifts as well. There are so many delicious and easy options that everyone can enjoy without worrying about the unhealthy side effects of so many holiday treats. 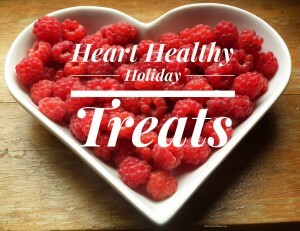 Here are some great edible holiday gift ideas with heart healthy ingredients that you can use for your holiday treats. These cute little bites are amazingly simple and completely delicious; they might disappear more quickly than you anticipate. Simply take some fruits such as bananas, strawberries, and apples, and slice or cut into small cubes. Skewer the fruit chunks on toothpicks and then dip into natural peanut butter and dark chocolate. Place on trays lined with parchment paper and refrigerate to solidify the coatings. There are virtually endless options for making your own trail mix and other mixed bunches. Use heart healthy ingredients like dried fruit, nuts of all sorts, seeds, popcorn and more to make your very own specialized mix. Dust with cocoa powder or cinnamon for an extra pop of flavor. Mixed bunches are super easy to package in individual bags tied off with ribbon, or in easy to find holiday containers. You don’t have to spend a lot of money on buying edible fruit art when you can make it yourself quite easily. Simply purchase some wooden skewers and craft foam in the shape of your choosing. You can make beautiful bouquets, awesome shapes, and whatever else you think up. The fruit is delicious by itself, or you can dip some of it in dark chocolate or natural peanut butter for a more advanced look and great taste. Sweet treats can be heart healthy too. There are recipes available everywhere for heart healthy cookies, especially delicious oatmeal raisin cookies. Using whole wheat flour, oats, and making some other heart healthy substitutions can make just about any cookie recipe heart healthy. In many recipes, you can substitute unsweetened apple sauce for any oil, carob or real dark chocolate for candies or chocolate chips, and use dates in place of sugar. Make cookies or even bars that your loved ones will never forget. Delicious gifts like these will not only make the holidays so much easier on you, but your friends and family will love them. The fact that they are all made with heart healthy ingredients is an added benefit that will show your loved ones just how much they are loved. In no time at all, your delicious edible gifts will be a favored holiday tradition. For more heart healthy holiday ideas click here!